USS SPRINGFIELD is the eleventh of the 23 improved LOS ANGELES class nuclear powered attack submarines. This section contains the names of sailors who served aboard USS SPRINGFIELD. It is no official listing but contains the names of sailors who submitted their information. 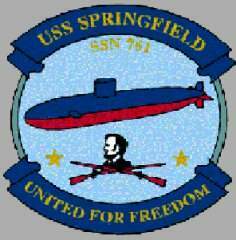 Click here to see which USS SPRINGFIELD memorabilia are currently for sale on ebay.